The government has made a fresh plea to MPs to get behind Theresa May's Brexit deal in Tuesday's crucial Commons vote. No 10 says it is alarmed by reports MPs plan to take control of Brexit if Mrs May's deal is voted down, although a leading Tory rebel denies such a move. And Labour leader Jeremy Corbyn has vowed to table a vote of no confidence in the government if she loses, which could trigger a general election. The PM has warned of a "catastrophic" breach of trust if Brexit is thwarted. Writing in the Sunday Express, Mrs May told MPs: "It is time to forget the games and do what is right for our country." Kuenssberg: What's next if MPs reject May's deal? I'm confused... what's happening with Brexit? Can Parliament stop a no-deal Brexit? About 100 Conservative MPs, and the Democratic Unionist Party's 10 MPs, are currently expected to join Labour and the other opposition parties in voting against the deal. If the deal is rejected Theresa May will get three working days to come up with a "plan B"
Monday, 21 January - Expected Commons vote on "Plan B"
Brexit Secretary Stephen Barclay told the BBC's Andrew Marr show there was greater "uncertainty" after Commons Speaker John Bercow's decision last week to allow MPs to change the parliamentary timetable. He warned "those on the Brexiteer side seeking ideological purity" by voting down Mrs May's deal they risked "leaving the door ajar to ways that increase the risk to Brexit". "There are lots of different plans being put forward by Members of Parliament that don't respect the result (of the referendum) or risk no deal," he added. Pressed on what would happen if the deal is defeated, Mr Barclay said he suspected the Commons would support something "along the lines of this deal" but declined to speculate on whether the government had a Brexit "plan B". 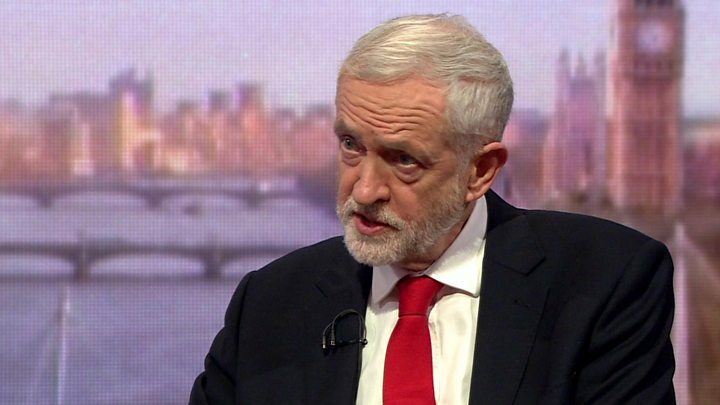 Media captionJeremy Corbyn on how Labour would negotiate Brexit: "The EU is well known to be flexible"
Mr Corbyn said Labour would vote against Mrs May's deal and, if she lost, would start moves to trigger a general election. He told Andrew Marr: "We will table a motion of no confidence in the government at a time of our choosing, but it's going to be soon, don't worry about it." The Labour leader has said his party does not have the votes in Parliament to win a confidence vote on its own and has appealed to other parties to support it. Northern Ireland's DUP party, which keeps Mrs May in power, is also planning to vote against her deal but has said it will support Mrs May in a confidence vote. If a majority of MPs back a no confidence motion, the government - or any anyone else with sufficient support - will get 14 days to try to win another confidence vote. If no-one can do that, a general election will be held. Mr Corbyn is facing growing calls from within his own party to back a second EU referendum. He told Andrew Marr he hoped to get a general election first - and ensure that the UK did not leave without a deal. "My own view is that I'd rather get a negotiated deal now, if we can, to stop the danger of a no-deal exit from the EU on 29 March - which would be catastrophic for industry." A "no-deal" Brexit is where the UK would cut ties with the European Union overnight without a transition period. Theresa May's government, and many others, believe this would be hugely damaging and want a more gradual withdrawal. But if Parliament can't agree on that, and nothing else takes its place, the UK will leave without a deal. The UK would be free to set its own immigration controls. However some UK professionals working in the EU and UK expats could face uncertainty until their status was clarified. The European Commission has said that even in a no-deal scenario, UK travellers won't need a visa for short visits of up to 90 days. But critics - including both Brexit supporters and opponents - say that leaving without a deal would be a disaster for the UK: driving up food prices, leading to shortages of goods and gridlock on some roads in the South East resulting from extra border checks. Asked whether Labour would campaign to leave the EU if a general election was called, Mr Corbyn said his party would "decide our manifesto content as soon as we know there's an election coming". He said he would have to ask the EU to extend Article 50, the legal process taking the UK out of the EU on 29 March, if he won an election, which he said would take place in February or March, to allow time for a new Labour government to negotiate a Brexit deal of its own. Mr Corbyn wants the UK to be part of a customs union with the EU, with access to the single market. But a group of MPs, including former Tory ministers, are reported by the Sunday Times to be working on a way to allow non-government members to take control of the timetable and bring forward legislation making it illegal to leave the EU without a deal, if Mrs May loses Tuesday's vote. Downing Street has said it is "extremely concerned" about the reported plot, which it says could potentially overturn centuries of Parliamentary precedent. A leading Conservative Remainer, who declined to be named, has told the BBC he is not aware of any plans to change Commons rules. He dismissed newspaper stories about backbench plots as "fantasy", designed to frighten Brexiteer Tories into backing Mrs May's deal. But the SNP's leader at Westminster, Ian Blackford, said MPs must now take control of the Brexit process from the government to prevent a no-deal scenario. 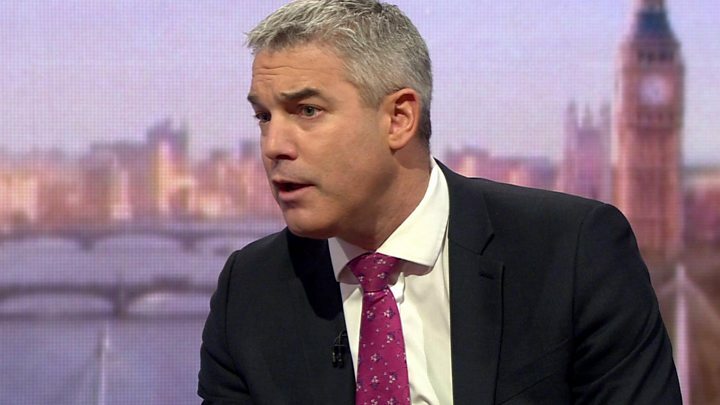 He told the BBC's Sunday Politics programme: "The prime minister's got to stop threatening Parliament and indeed, threatening the whole of the United Kingdom, that it's a choice between her deal and no deal - that's not the case." Lib Dem leader Sir Vince Cable, who like Mr Blackford backs another EU referendum, said: "I think Parliament will take control of this process, will insist that we pursue the option of no Brexit." Sir Vince said this could happen by cancelling Article 50 - which he noted would be "resented by lots of people" - or via a second referendum. But former Brexit Secretary David Davis said MPs should vote down Mrs May's deal - and the government should then go back to the EU with "our best and final offer" of a free trade deal with no tariffs, along the lines of the deal the EU has with Canada. "If the EU insists on no deal, then fine," he says in an article for the Sunday Times. The government has previously rejected Mr Davis's proposals, which are backed by other Brexiteer Tories, saying they would not solve the Northern Irish border problem.